Recording television signals in the 1920’s? Surely technology was nowhere near ready for recording a video signal back then? Wasn’t it Ampex that achieved it in the late 1950’s? Not to belittle Ampex Corporation’s major achievement, the Scottish inventor, John Logie Baird, did in fact succeed in becoming the first to record television in 1927. This was only a year after being lauded as the first person to demonstrate television. However, no-one said anything about Baird being able to play the pictures back! So how did a mere inventor with little resources steal this ‘first’ from major corporate industry – by 30 years? Recording the television signal in the 1920s was much simpler than you might at first think. With only 30 lines per picture (television frame), the highest frequency present was low enough to be audible. The video signal could therefore be recorded as an audio signal onto disc. Baird did more than create a ‘first’ on paper. Some of those disc recordings still survive. Until this restoration, attention had been focused elsewhere as the discs had defied attempts to replay recognisable pictures from them. Baird himself never did publicly demonstrate video playback of the discs, most likely because he failed to overcome the problems. It looks like the ‘Phonovision’ recordings weren’t attempts by Baird to create historic documents of television’s development – that’s one way of seeing them today. They were only a byproduct of Baird’s attempts to make the ‘Phonovisor’ – the combined disc playback and display device that would allow ‘Phonovision’ discs to be played back with perfect synchronisation. If it had been successful, the ‘Phonovisor’ would have been the first and by far the cheapest television video disc player and combined display ever built. To do that though, Baird and his fledgling team in late 1927 had to get a means of recording the discs so that they would play back with a stable picture. 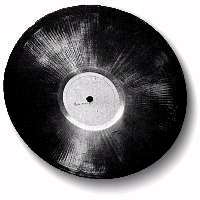 By March 1928, the last of the surviving ‘Phonovision’ discs managed to get close by having fully synchronised images but with residual serious problems. Now, the fairly rudimentary software I used in the 1980s and 90s allows us to see the images and understand them for the first time. The limitations of the discs makes the recovered imagery fall far short of the original studio quality. We cannot therefore say how good or how bad the 30-line system was, based on the quality or content of these experimental images. Through what is almost an archaeological dig, we can now understand and appreciate not just the pictures but how the recordings were made and what problems Baird encountered in trying to achieve a practical method for video recording. Most of the restoration work has focused on uncovering the early recordings made by Baird. These are among the most significant in television’s early history and as such have attracted the greatest analysis. The following pages outline the results of that work.